LOOK OUT! THE BRIIICS ARE COMING! NOTE BY NANCY: Americans, in particular, receive news regarding only what the dark cabal wants us to hear—be it outright lies, propaganda, or an insignificant measure of truth. We are taught by the mainstream media to refer to certain world leaders as “enemies” according to what the cabal has up its sleeve. “American interests“ has nothing to do with the American people; the phrase means the “interests of the cabal.” The people of America or any other country are never on the minds of the cabal, except to think of us as sheeple to enslave and use for their own purposes. This article will reveal another worldview … the way other countries feel about the West and what is in the works about which Americans hear nothing, but will impact our lives! Yes, BRIIICS, with three “I”s. That’s because to the countries of Brazil, Russia, India, China and South Africa (which have just held a summit in Durban, South Africa) will soon be added Iran and Indonesia. Iran is a stalwart moral and political leader. It stands up against Zionism. It has huge natural resources. It is making extraordinary technological progress. It will soon be a BRIIICS member. And so will Indonesia, which has the world’s fourth largest population, a fast developing economy (around 7% per year) and, again, huge natural resources. Already, the present BRICS have 40% of the world’s population, 30% of its land mass, and 25% of its GDP with the latter being a sharply rising figure. Other countries, like Venezuela, Turkey, Egypt, Pakistan and Malaysia, are certain to join in. Much more important, however, is the BRICS decision to set up a new development bank for long-term infrastructure. This is intended to rival, indeed, outclass, the Western-backed institutions. The underlying rationale is simple: the BRICS are determined to challenge Western political and economic dominance and, in particular, to break the dominance of the International Monetary Fund and the World Bank, which have not served the development needs of poor countries and have generally served only to put them into ever-increasing, un-repayable debt. All of which is excellent news. The West has exploited emerging and poor countries and everywhere has been financially and militarily aggressive. Put simply, other countries are fed-up with the West: they have had enough. The new bank, however, has more purposes than just being a development bank. American aggression, for example, is ultimately dependent upon the US dollar being the world’s reserve and main trading currency. 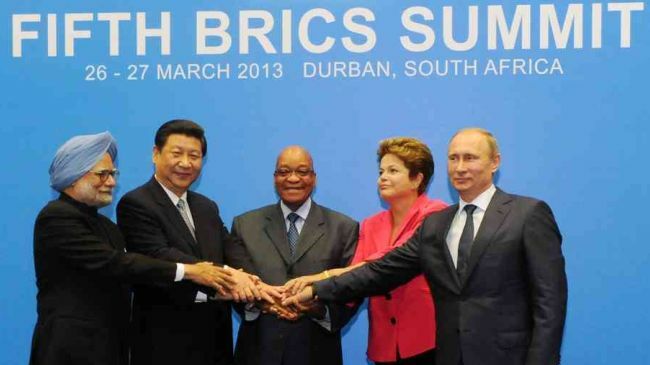 The BRICS are going to end that by establishing a new reserve and trading currency. Indeed, the situation can be put even more clearly. The West has long exploited and oppressed everybody that it could but now the boot, in the traditional metaphor, is on the other foot. Political power is shifting away from the West; economic power is shifting away from the West and its moral authority has almost completely disappeared (torture, assassinations, the creeping genocide of the Palestinians and the deliberate furtherance of a vicious sectarianism have seen to that). Significantly, the BRICS are objecting to sanctions and war threats against Iran and are strongly opposed to Zionist Israel. It will not be long they declare that Israel is a pariah state. Perhaps the most significant outcome of the BRICS summit is the proposed creation of an optic fibre cable linking all five states (with relatively easy extensions to Iran and Indonesia). Indeed, it could be that the BRICS are constructing an independent global optic fibre internet system or at least an extensive one over which they will have complete control. The BRICS are intensely aware that the USA, denying the evidence of its own sixteen intelligence agencies, is pursuing a Zionist agenda against Iran which includes excluding Iran from the SWIFT international banking system and other banking transactions. The new cable should put an end to that. The BRICS are raising the flag of independence and are telling the West that its abuse of others has gone so far that the others are going to make their own way in life. And that will really matter because more and more Non-Aligned Movement nations will be joining the BRICS in various ways which will particularly include regional, economic, financial, military and technological agreements. An example is that China and Brazil have signed a currency swap deal under which they will be using their own currencies for half of their mutual trade i.e., the US dollar will not be involved. For a while the US dollar can be expected to remain the main trading currency – until suddenly it isn’t. Furthermore, Africa, for example, long exploited solely for its minerals and resources with no concern for the lives of the inhabitants, is simply going to turn to those who can provide the one big thing that Africa needs – industrialisation. The importance of the BRICS summit cannot be overestimated partly because it represents new countries beginning to take power and partly because it heralds a new world coming into being. However, a new world is not necessarily a better world and the BRICS, becoming the BRIIICS and much more, must be careful not to incorporate, without realising, assumptions and practices stemming from corrupt old Western institutions, thinking and practices. Chief of these is thinking that it does not matter if there is huge rich-poor division. This is at the heart of corrupt Western ‘trickle-down’ economics and is a complete breach of fundamental market principle, which says that producers and consumers must be the same people i.e., real productive (and therefore consuming) power must be spread to everyone in society. Another corrupt assumption is that interest is necessary for the spreading of real productive capacity. Interest is not necessary: it is an unnecessary tax imposed by the global financial elite merely for its own benefit. The BRIIICS must ensure that the commercial banks are controlled so that they can only lend their own money (which they can then waste, if they want to, or charge interest on it). But the main money supply, for the spreading of the real economy, must stem, interest-free, from the national bank (although it may be administered by the commercial banks making only a fair administration charge).